BTP offers hundreds of miniatures from the popular game, War Machine and Hordes Table Top War Game we also carry Scenery, and Terrain. This is a metal on metal Warmachine game that is set in the Iron Kingdoms. This world offers traditional fantasy with steam power and gunpowder themes. These different races have rivaled for centurys and have now exploded into all out war. Miniatures for Warmachine are generally 30 mm and each player has an elite soldier/sorcerer who leads an army into battle to take over the kingdom. 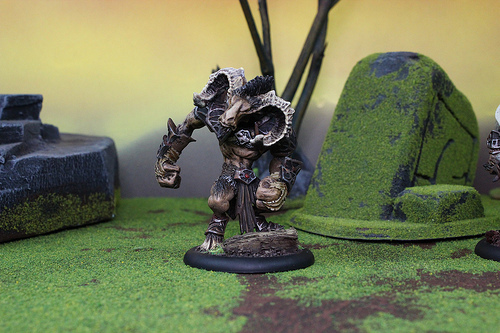 Hordes is the other favorite of Privateer Press. It is also set in the world of the Iron Kingdoms. The Hordes are wild factions that are at war to protect there ancient homelands. Some are fighting just to take over the world. Like Warmachine, players control a powerful Battle-Wizard that uses the fury of the Savage Warbeasts who stalk the Iron Kingdoms. The Warlocks are able to link with these beasts to create chaos wherever they go. 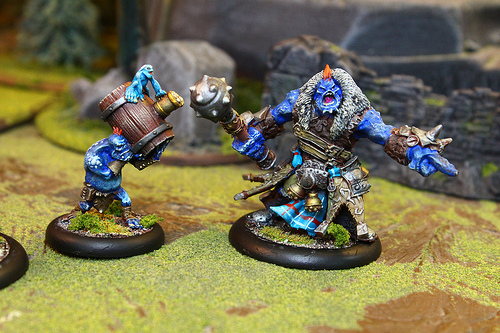 Blue Table Painting has the unique ability to not only supply you with your miniatures, but also to paint a unique army at high levels to make your gaming experience the best it can be.